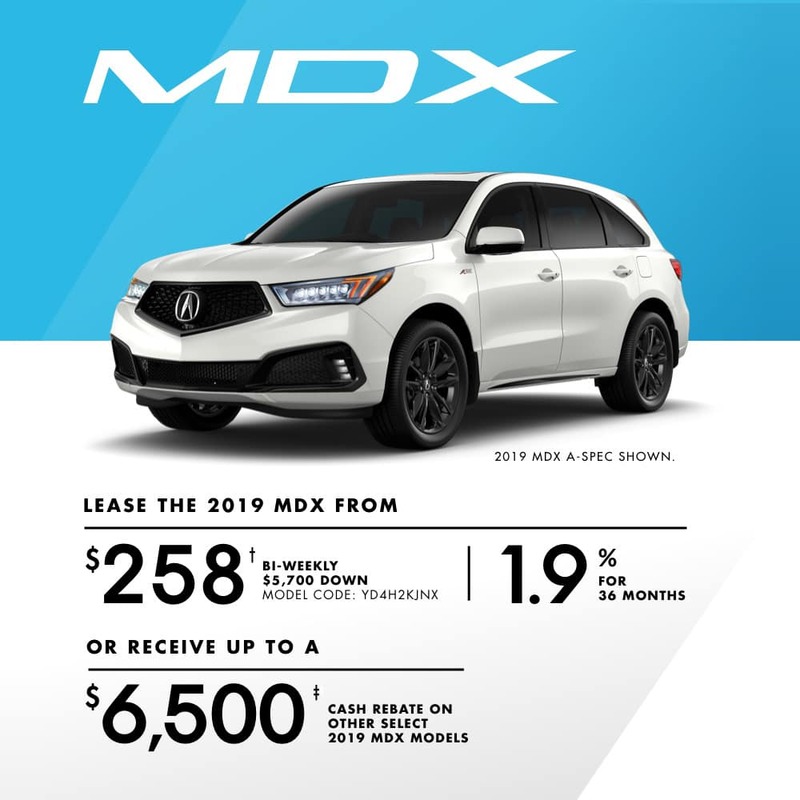 Get up to $6,500 in cash savings or lease the 2019 Acura MDX from $258 bi-weekly at 1.9% for 36 months OAC. Some conditions apply. This offer ends on April 30, 2019. Book your test drive today! 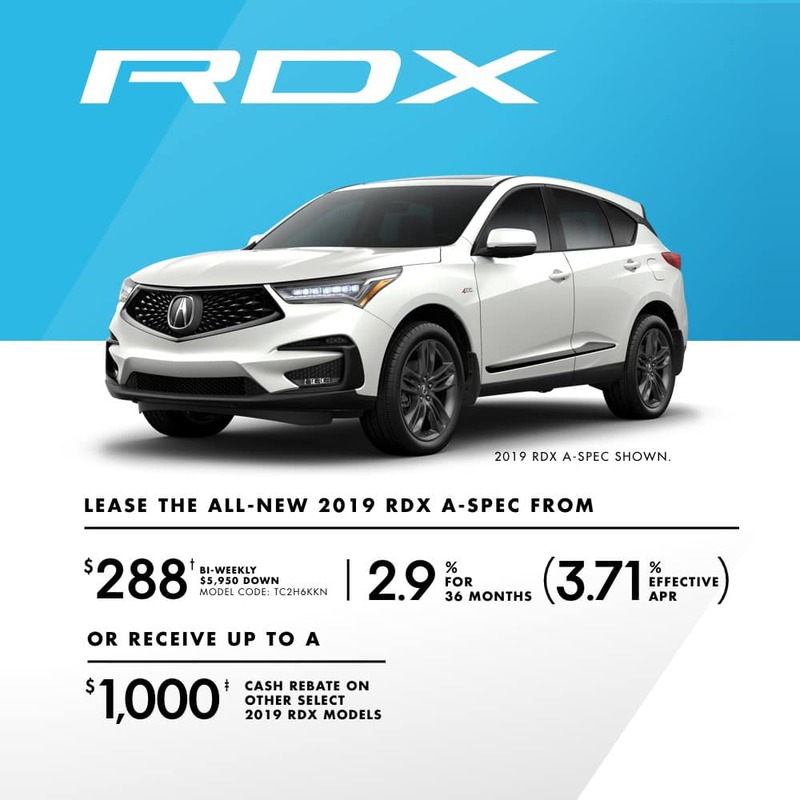 †Limited time lease offer based on a new and previously unregistered 2019 RDX A-SPEC (TC2H6KKN) with optional colour upgrade available through Acura Financial Services on approved credit. Representative lease example: 2.9% (3.71% effective APR) lease rate for 36 months (78 payments). Bi-weekly payment is $288 with $5,950 down payment. 16,000 km allowance/year; charge of $0.12/km for excess kilometres. Total lease obligation is $28,414. Lease payment includes freight and PDI of $2,075 and applicable fees/levies/duties (all of which may vary by region and/or dealer) but does not include lien registration fee up to $70.75 and lien registering agent fee of $5.00, which are due at time of delivery. Taxes, insurance, licence and registration fees (all of which may vary by region) are extra. 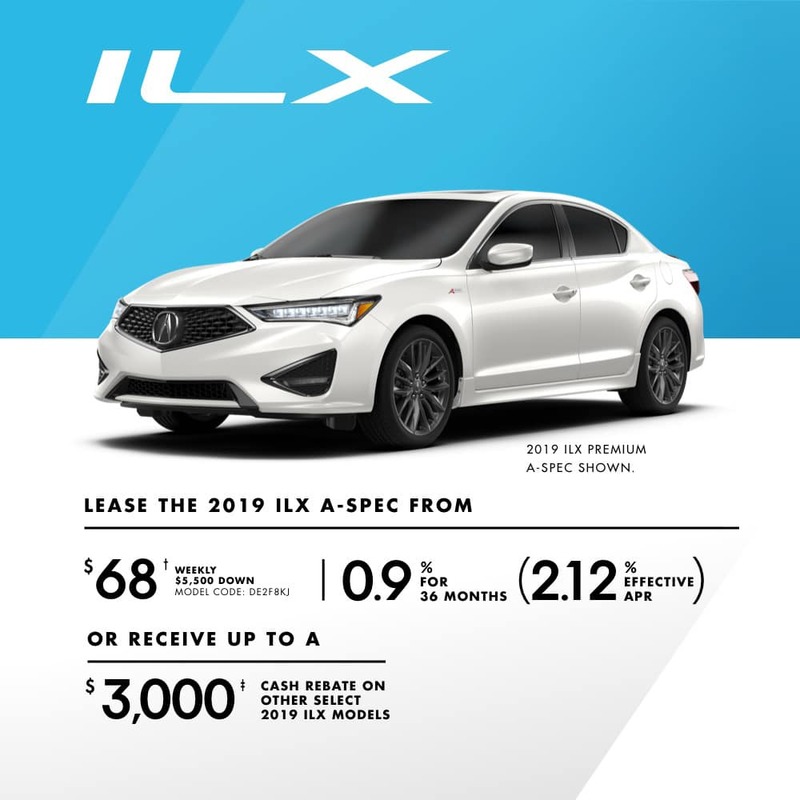 ‡$1,000 cash rebate available only on the cash purchase of new and previously unregistered 2019 Acura RDX Tech (TC2H3KK), RDX A-SPEC (TC2H6KKN), RDX Elite (TC2H7KKN), and RDX Platinum Elite (TC2H9KKN) models from an authorized Acura dealer when registered and delivered before April 30, 2019. Total incentives consist of $1,000 that cannot be combined with lease/finance offers. All incentives will be deducted from the negotiated selling price after taxes. Some terms/conditions apply. Model shown for illustration purposes only. Offers end April 30, 2019 and are subject to change or cancellation without notice. Dealer may sell/lease for less. Dealer order/trade may be necessary. While quantities last. Certain features only available on certain trims. 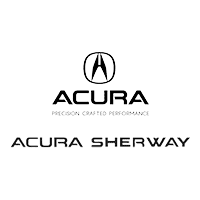 Visit acura.ca or your Acura dealer for details. 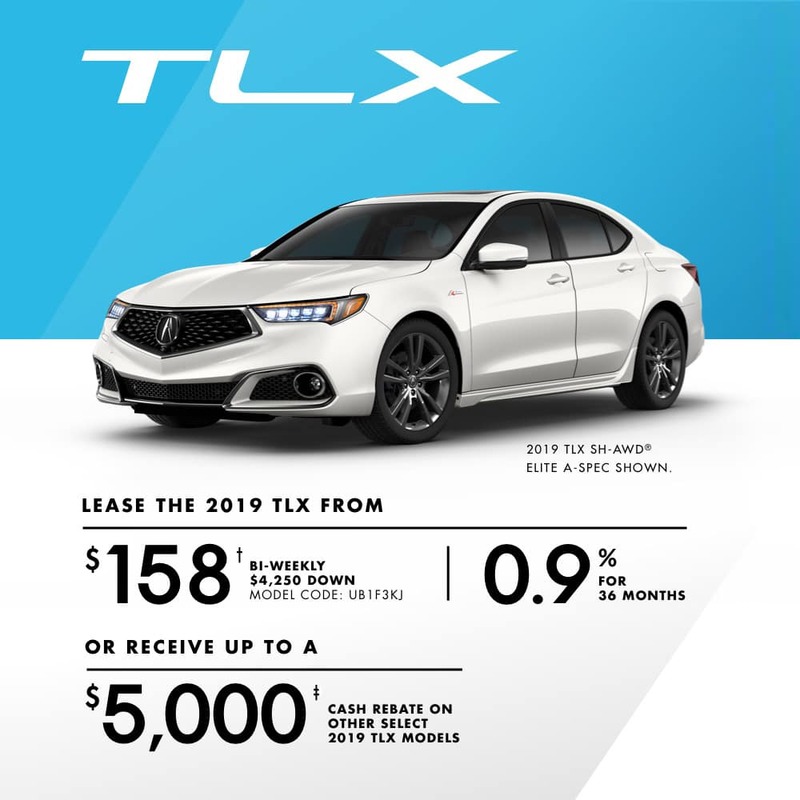 © 2019 Acura, a division of Honda Canada Inc.
Get up to $5,000 in cash savings or lease the 2019 Acura TLX from $158 bi-weekly at 0.9% for 36 months OAC.